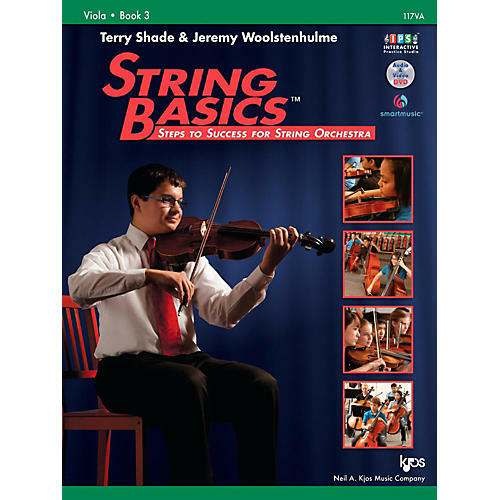 String Basics Book 3 by award-winning authors Terry Shade, Jeremy Woolstenhulme, and Wendy Barden, continues with a strong pedagogy and step-by-step sequences of instruction preparing students for grade 3 performance literature and beyond. Book 3 opens with independent instrument tuning, then a critical review section allows students to be prepared for shifting & position work, new major & minor keys, the chromatic scale, and advanced note values & rhythm combinations. All are reinforced with technical exercises and a wide sampling of classical and cultural music. Book 3 concludes with vibrato development exercises specially designed for heterogeneous classrooms. Like with all String Basics method books, Book 3 features the popular Interactive Practice Studio and Interactive Teacher Studio, accessible on any Windows or Mac computer. Each student book and Teacher's Edition comes with a DVD containing video lessons and accompaniment Practice Tracks (also provided in the IPS and ITS).